Thanks to Dr. Vladimir Zaitsev, Orenburg State Oncology Hospital, Russia, for contributing this case. To contribute a Case of the Week, follow the guidelines on our Case of the Week page. Epitomics is pleased to mark its 10th Anniversary as the source of Rabbit Monoclonal Antibodies! For a limited time, select EP Clones are now 50% OFF. View the full list here. EP Clones are generated using our patented RabMAb� technology and have been validated for IHC use, offering superior binding affinity and specificity. Fully validated, ideal for FFPE tissues. For more information, contact us at 877-772-2622, IVDinfo@epitomics.com or visit our website by clicking here. (1) We are looking for more Cases of the weeks. Those submitted this month will be posted quickly, since the queue is short. Email your cases to NatPernick@hotmail.com. (2) Dr. Pernick has posted a research paper, The Laws of Complexity and Self-organization: A Framework for Understanding Neoplasia, and invites your comments to NatPernick@hotmail.com. (3) We will be updating the topics in the Stains and CD Markers chapters more frequently. If you want to see more information on a particular marker, let us know. 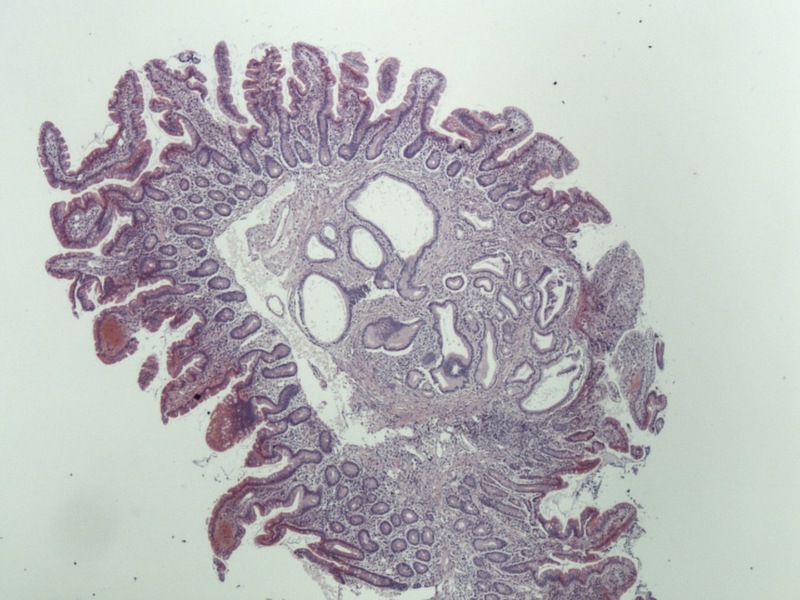 A 39 year old woman had an upper GI endoscopy, which revealed a small duodenal polyp, which was totally excised. 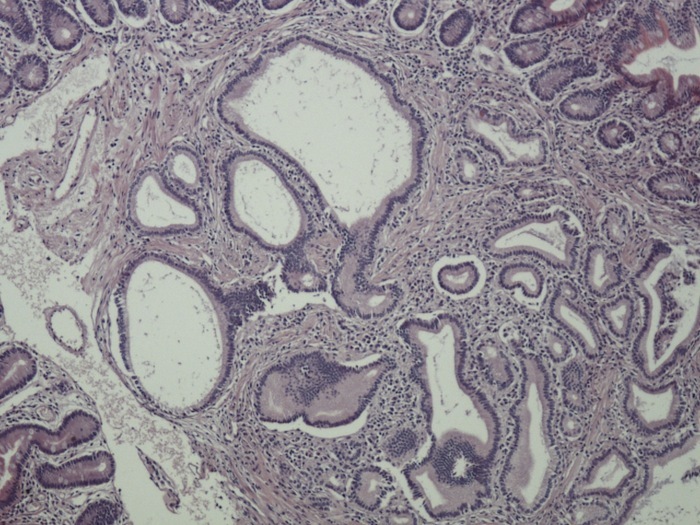 Pancreatic heterotopia is a common congenital anomaly which occurs throughout the GI tract. It is usually asymptomatic, detected incidentally or at autopsy (J Gastrointest Surg 2011;15:631), although it rarely presents with intermittent gastric outlet obstruction (Ulster Med J 2010;79:100). Pancreatic heterotopia is defined as the presence of pancreatic glandular tissue at sites with no structural or vascular contact with the main pancreas. It usually occurs in the proximal gastrointestinal tract (Med Sci Monit 2006;12:CS49). There are four histologic types: total (all cell types), canalicular (ducts only), exocrine (acinar cells only) and endocrine (islet cells only). Ultrastructural studies may show regressive changes in the cytoplasm of the exocrine secreting epithelia, leading to necrosis of the cells, more prominent in the basal area of the secretory epithelium. These changes are attributed to regressive damage of the organelles carrying out secretory activity (Ultrastruct Pathol 2006;30:75). Most pancreatic heterotopias are asymptomatic and require no treatment. These lesions are difficult to diagnose preoperatively as the cause of GI symptoms. Symptomatic lesions should be excised.